We have several Fantasy Football title plate layouts for this award. Our NEW ceramic mugs can hold 21 ounces of your favorite beverage, with your bragging rights for everyone to see. 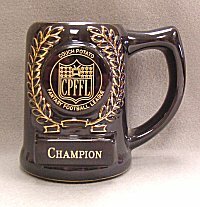 This mug features two black brass plates (which engrave gold) for your league information and your winner's name.